Professors' Picks | Housing and Residence Life, U.Va. One of the unique benefits of living on Grounds is the opportunity to participate in the Professors' Picks program! Professors' Picks invites students living on Grounds to a free dinner and discussion on a specific topic. UVA faculty members choose the subject and related brief readings, which UVA students complete over Winter Break. 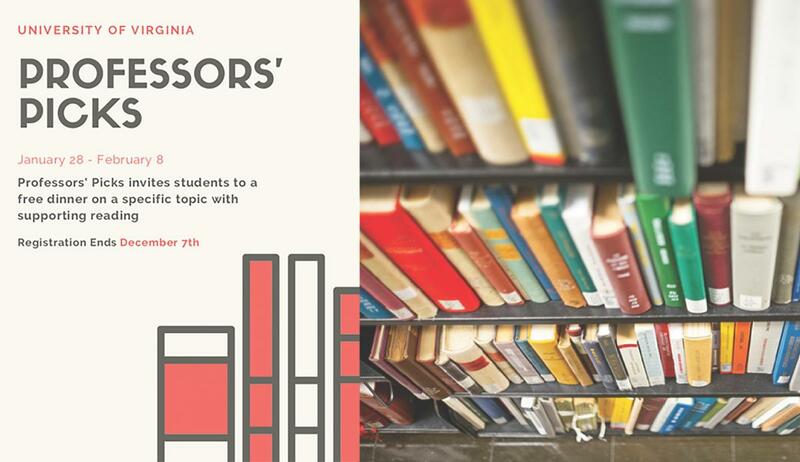 During the spring semester, faculty members and students gather over a dinner to discuss the topic and readings with one another, a wonderful chance to interact and learn from a professor or faculty member you might not have encountered in the classroom otherwise. Professors' Picks will take place between January 28 and February 8, 2019, depending on the date chosen by each professor. This enriching program and experience is open to all UVA students living on Grounds. Upperclassmen are encouraged to register! Participating is a great way to network and build connections that will surely prove beneficial in the years to come. Students living on Grounds can sign up for the Professors' Picks program at https://goo.gl/forms/ryeMADtLTdmvkLiu1. Simply follow the instructions to select the program in which you’d like to participate. Note that you should be logged onto UVA Netbadge first, and the programs are assigned on a first-come, first-served basis (registration is capped at 15 students per program). The registration deadline is Friday, December 7 at 11:59 p.m., so reserve your spot today!